Use AquaCleanse Tapwater Detoxifier to: Eliminate common chemicals in tapwater Remove chlorine, chloramines and ammonia Instantly detoxify tap water Dextoxify water with no odor Most tap water contains considerable amounts of chlorine, chloramines and/or ammonia. These chemicals make the water safe to drink by preventing micro-organisms from growing in the drinking water. But these chemicals are toxic to fish, corals and other invertebrates and must be removed before placing animals in your aquarium. Unlike some products that only mask these chemicals AquaCleanse destroys them  completely removing these harmful chemicals from the water with no unpleasant odor! 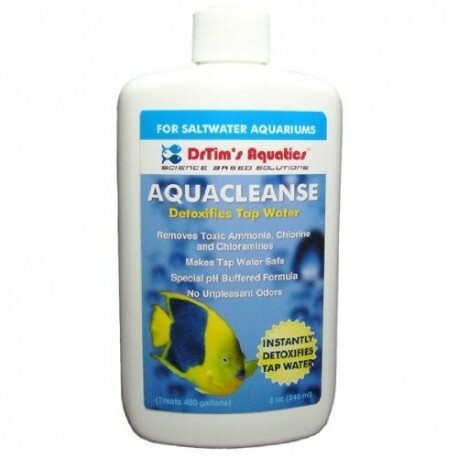 Aqua Cleanse 60ml Salt has not been evaluated yet.